laboratories for modern research along the frontlines of atmospheric science. 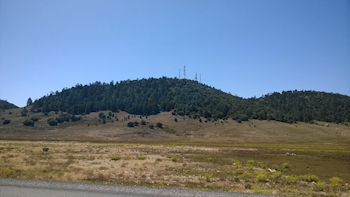 The ATLAS-MOHAMMED V Atmospheric Research Station is operated by Mohammed V University (UM5) Rabat, Centre National de la Recherche Scientifique (CNRS-ICARE, Orléans) and University of Orléans. 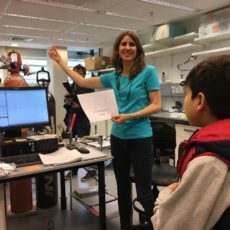 This project has received funding from the European Union’s Horizon 2020 research and innovation programme under grant agreement No 690958. 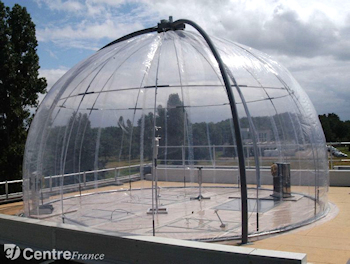 HELIOS is a large hemispherical outdoor simulation chamber (volume of 90 m3) positioned on the top of ICARE-CNRS building in Orléans.HELIOS is dedicated mainly to the investigation of the gas phase processes and radical chemistry under different conditions (sunlight, artificial light and dark). It is equipped with a large set of instrumentation: in-situ FTIR (up to 500 m path length), PTR-ToF-MS (Ionicon 8000), Aerodyne ToF-CIMS, ATD-GC-MS, UHPLC, IC, SMPS, Lopap, HCHO (Aerolaser), Spectroradiometer, Monitors (O3and NOx), …. Other instruments for radicals measurements are under development (FAGE for HOx and CRDS for NO3). ISAC is a medium sized indoor simulation chamber which has been developed specifically to investigate interfaces processes such as air-water-air, air-sol,…, interfaces. 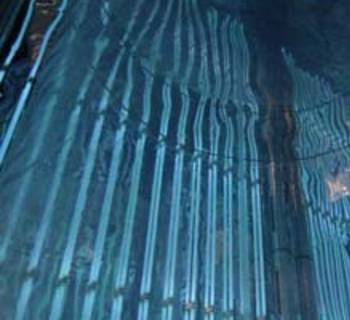 It is made of a 2m3Teflon envelop embedded in a structure containing the irradiation system UV and visible light sources. On the floor of the chamber sits a tank which can be filled with any liquid/material/chemicals. The liquid filling and emptying can be done without opening the chamber. The cuboid shape of the chamber allows people to enter by a door to manually scrub the walls and the tank allowing to minimize the memory effects of the chamber. The simulation chamber LEAK has a cylindrical geometry, a volume of 19 m3and is made of Teflon FEP film. 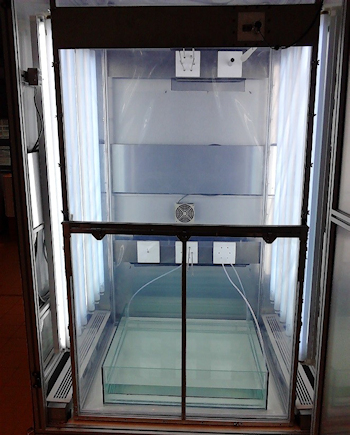 LEAK is equipped with a humidifier, ozone and particle generators.Fifty-six UV lamps (100W Eversun Super, Phillips) are used to illuminate the aerosol chamber. LEAK experiments are performed at humidities up to 80%, allowing the study of multiphase chemical processes with deliquescent particles. 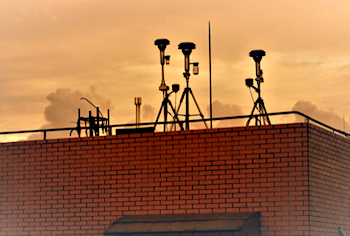 The Leipzig Aerosol and Cloud Interaction Simulator (LACIS) is a world-widely unique infrastructure for investigating aerosol-cloud-interaction processes under well-defined fluid- and thermodynamic conditions. 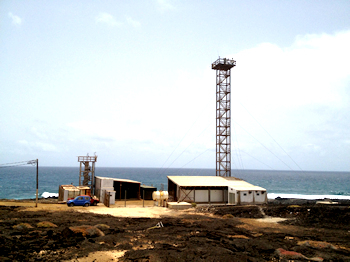 National Meteorological and Geophysical Institute (INMG), Cape Verde. 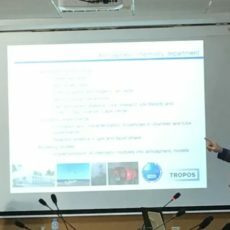 The Cape Verde Atmospheric Observatory (CVAO) is part of a bilateral German-UK initiative to undertake long-term ground- and ocean-based observations in the tropical Eastern North Atlantic Ocean region. 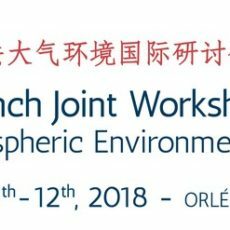 The CVAO (16° 51′ 49 N, 24° 52′ 02 W), exists to advance understanding of climatically-significant interactions between the atmosphere and ocean and to provide a regional focal point and long-term data context for field campaigns. Measurements of O3, CO, NO, NO2, NOy and VOCs began at the site in October 2006. Chemical characterisation of aerosol measurements and flask sampling of greenhouse gases began in November 2006, halocarbon measurements in May 2007, and physical measurements of aerosol in June 2008. On-line measurements of greenhouse gases began in October 2008. The CVAO is a World Meteorological Organisation-Global Atmospheric Watch (WMO-GAW) global station and quality-assured atmospheric data for use by both UK and German scientists, and the wider international community are regularly deposited at both the WMO-GAW and British Atmospheric Data Centre (BADC) data archives.